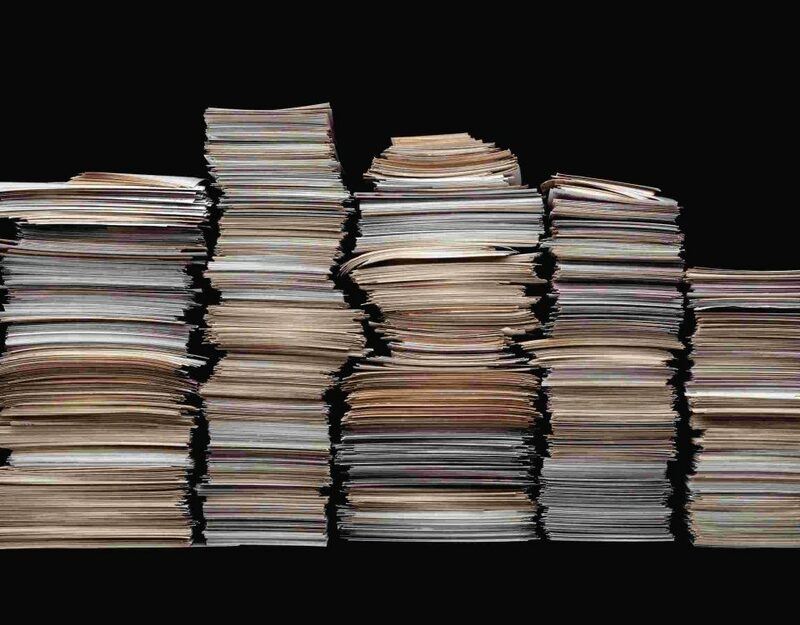 Some government agencies just hate releasing their records. The FBI and the USDA recently have proved they’ll do just about anything to skirt transparent recordkeeping, and I’d like to add the Federal Aviation Administration to that list. On Jan. 12, I requested two years’ worth of airspace hazard notifications sent by the FAA to project developers when proposed structures, such as oil rigs and wind turbines, were judged to be a possible impediment to air traffic. The agency conducts about 100,000 assessments each year to determine whether structures are safe to build, and in some cases it finds that a proposed development would be hazardous for air traffic. In less than a week, the FAA responded -- by saying the information requested is already available on its website. It isn’t. I asked the agency to continue processing the request and provide the relevant documents. After wrangling over whether I’m actually a journalist (which apparently is difficult to prove) I also was informed my request for a fee waiver was denied. 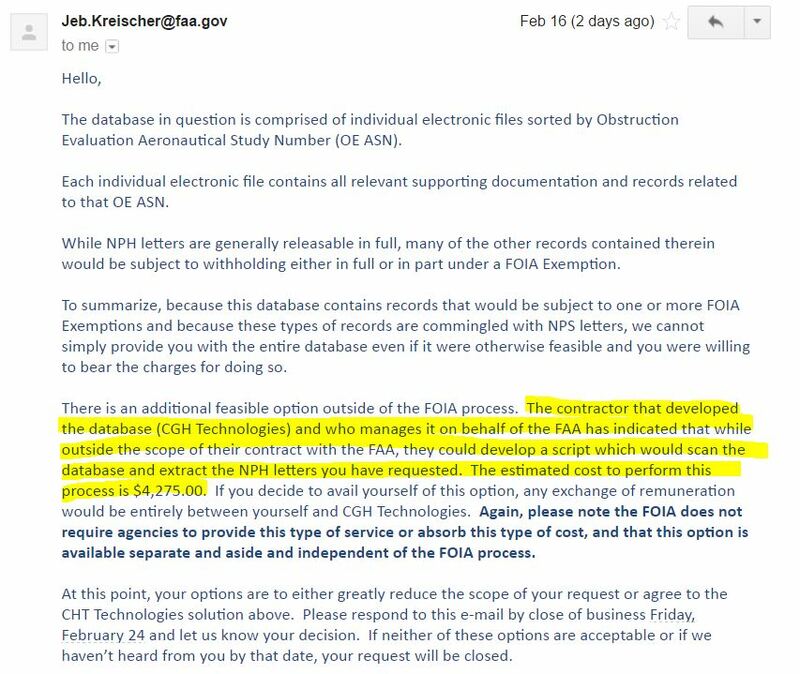 On Feb. 14, I was told by agency FOIA officer Jeb Kreischer that the FAA would charge $461,300 to produce the notifications, a process that would take five years to complete. When I asked Kreischer why access to the dataset is so expensive, he said that the requested documents are commingled with other, confidential documents, which means the records I want would have to be individually downloaded and saved. Strangely, the FAA offered to set me up with its database contractor, who said it could supply me with the requested documents for the low, low price of $4,275. I declined. It appeared as if I -- and vis a vis the public at large -- was being punished for the FAA’s choice to keep records in such a way that they aren’t easily releasable. And it also appeared as if I, a destitute records requester, was being used as a way to make a buck for the contractor, CGH Technologies. Next I asked if I could just have the entire database, since obtaining the information that way wouldn’t require the contractor to manually locate and download thousands of files. No dice, Kreischer said, since FOIA doesn’t require release of some of the documents in the database. Furthermore, the entire dataset would cost $2.3 million and take 28 years to produce, he said. Since the main point of contention in this case is that some of the documents in the database aren’t subject to disclosure, I asked specifically what FOIA exemptions the agency was claiming. Kreischer refused. I insisted. Still no answer was given, and Kreischer closed the request, claiming it was “unreasonably burdensome.” I plan to file an appeal in the case. I’ve already sent a separate FOIA request for a copy of the contract CGH Technologies holds with the FAA. I suspect the agency will stonewall and overcharge for that information as well. FAA wants to charge $2,3 million for airspace hazard database . 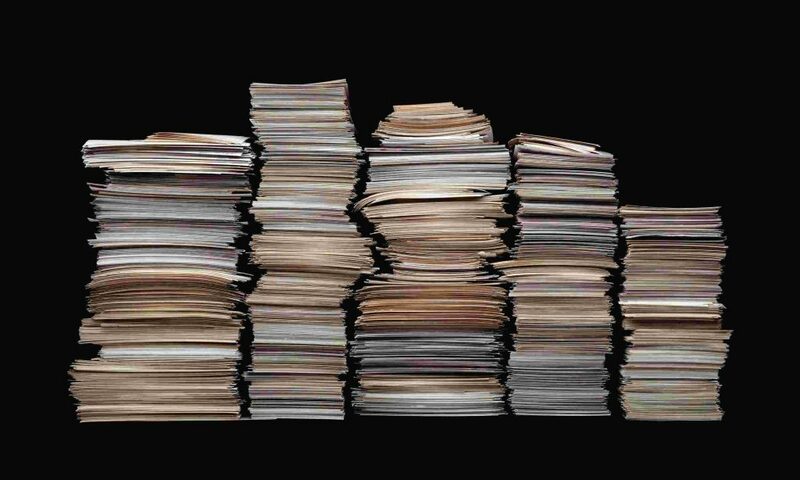 Some government agencies just hate releasing records. The FBI and the USDA recently have proved they’ll do just about anything to skirt transparent recordkeeping, and I’d like to add the Federal Aviation Administration to that list. On Jan. 12, I requested two years’ worth of airspace hazard notifications sent by the FAA to project developers when proposed structures, such as oil rigs and wind turbines, were judged to be a possible impediment to air traffic. The agency conducts about 100,000 assessments each year to determine whether structures are safe to build, and in some cases it finds that a proposed development would be hazardous for air traffic. In less than a week, the FAA responded — by saying the information requested is already available on its website. It isn’t. I asked the agency to continue processing the request and provide the relevant documents. After wrangling over whether I’m actually a journalist (which apparently is difficult to prove) I also was informed my request for a fee waiver was denied. 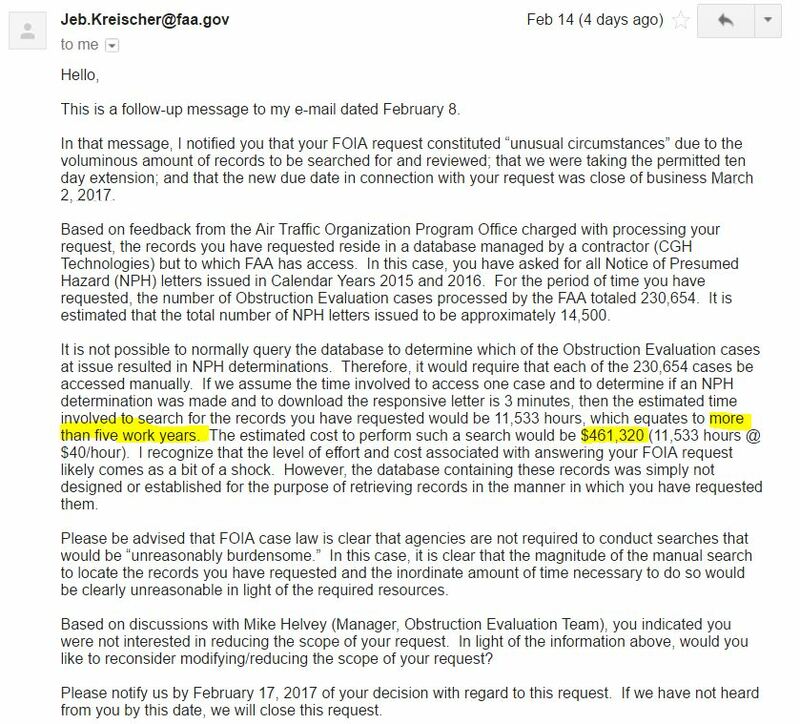 On Feb. 14, I was told by agency FOIA officer Jeb Kreischer that the FAA would charge $461,300 to produce the notifications, a process that would take five years to complete. When I asked Kreischer why access to the dataset is so expensive, he said that the requested documents are commingled with other, confidential documents, which means the records I want would have to be individually downloaded and saved. Strangely, the FAA offered to set me up with its database contractor, who said it could supply me with the requested documents for the low, low price of $4,275. I declined. It appeared as if I — and vis-a-vis the public at large — was being punished for the FAA’s choice to keep records in such a way that they aren’t easily releasable. And it also appeared as if I, a destitute records requester, was being used as a tool to fatten the wallet of the contractor, CGH Technologies. Next I asked if I could just have the entire database, since obtaining the information that way wouldn’t require the contractor to manually locate and download thousands of files. No dice, Kreischer said, since FOIA doesn’t require release of some of the documents in the database. Furthermore, the entire dataset would cost $2.3 million and take 28 years to produce, he said. I plan to file an appeal in the case. I’ve already sent a separate FOIA request for a copy of the contract CGH Technologies holds with the FAA. I suspect the agency will stonewall and overcharge for that information as well.